Because it is relatively scarce in the wild and possesses a playful, non-aggressive personality, the Panama Amazon parrot is a highly prized pet. This medium-sized green parrot can be a prodigious talker when trained diligently. The Panama Amazon parrot also goes by the common names Panama yellow-headed Amazon parrot and the Panama yellow-fronted Amazon parrot. The taxonomical name for the Panama Amazon parrot is Amazona ochrocephala panamensis or Amazona panamenisis, depending on if it is considered a subspecies of the yellow-crowned Amazon parrot (A. occhrecephala) or an independent species. The Panama Amazon parrot's natural range extends from northern Colombia to western Panama. Like the other Amazon parrot species, it dwells principally in rainforests. It is highly prized for the pet trade and is listed in appendix 1 of the CITES (Convention on International Trade of Endangered Species), meaning that trade and sale of wild birds are forbidden. Although trapping is outlawed, loss of habitat and illegal trapping has greatly reduced wild populations of this species. Make sure to buy a bird that is certified captive-bred. Panama Amazons are normally between 12 and 13 inches long from the beak to the tip of the tailfeathers. On average, it weighs around 13 ounces. In captivity, the Panama Amazon parrot can live 60+ years, although 40 to 50 years is more typical. A good family bird, the Panama Amazon makes a friendly pet that loves interacting with people. Their social nature helps to make them gentle and affectionate companions. While this is a loving bird, this is also a very active species, so this bird needs an owner that can keep up with it. It is imperative that it has a safe space to climb and play outside of the cage each day. Like all Amazon parrots, Panama Amazons may go through a hormonal bluffing stage during adolescence. For this reason, they are recommended for those who have experience keeping medium- to large-sized birds. Panama Amazons are mostly green with a bright yellow triangular patch on their foreheads. They have a patch of red on the tops of their wings, flesh-colored feet, and horn-colored beaks. The eye is orange surrounded by an unfeathered white ring. Their markings often lead people to confuse them with the popular yellow-naped Amazon parrot. 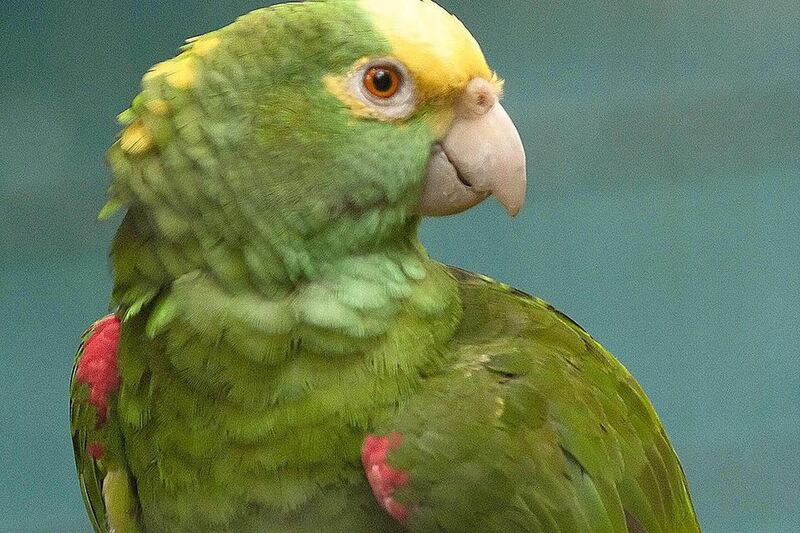 Panama Amazons are social, entertaining birds that have become increasingly popular as pets in recent years. Their high intelligence, coupled with their playful nature, makes them well-suited as pets for families and active households. This bird, although not large, needs a roomy cage. A good enclosure is one with a 2 x 3-foot footprint, with 2 1/2 to 5 feet in height. A playpen on top of the cage, including a hanging perch, will encourage exercise. Amazon parrots, including the Panama, can tolerate a wide range of temperatures but do keep them away from drafts. Amazon parrots thrive on social interaction, and they need it to remain healthy and happy. Birds that are neglected often fall into destructive behavior patterns and depression, which can manifest itself in various physical and emotional problems. It's important for Panama Amazon owners to set aside a period of time each day for one-on-one interaction with the bird, in order to establish and maintain a healthy bond. For owners unable to provide enough daily interaction, keeping a pair of birds may provide them with the social contact they need. While hand-fed Amazon parrots normally make loving, affectionate pets, many go through an aggressive stage during adolescence (at age 4 to 5) that some owners can't handle. While the phase does pass, it can sometimes last for up as long as two years. Potential owners should remember that if they adopt a Panama Amazon, they making a lifelong commitment! These birds can live in excess of 60 years if properly cared for, so keeping one is not a decision to be taken lightly. This is a rainforest bird, and it requires frequent shower baths. Bath time can be an opportunity for good interaction with your bird, and some owners have been known to take the bird into the bathroom shower with them each morning. More commonly, several showers each week using a sink sprayer is a very enjoyable experience for your Panama Amazon parrot. Like all Amazon Parrots, Panama Amazons do best on a high-quality pelleted diet, supplemented with seed mix and daily servings of fresh bird-safe fruits and vegetables. A fresh and varied diet will help ensure that your bird maintains top nutrition. Panama Amazons enjoy eating with the family, and can it be allowed a wide range of nutritious human food, although care should be taken not to let them over-eat. As with all parrots, avocado and chocolate are toxic to these birds. Amazon Parrots are prone to excess weight gain, so it's important that they are allowed room to exercise every day. If you want a Panama Amazon, you should be able to give the bird a minimum of 3 to 4 hours outside of its cage per day. This will allow the bird to burn excess calories and stretch its muscles, as well as providing it with essential mental stimulation. These birds are heavy chewers and will need plenty of toys to chew on and play with. This is a remarkably healthy bird when adequately cared for, but it does sometimes develop the same common problems found in other Amazon parrots. Bacterial infections may occur. Symptoms include runny droppings and obvious respiratory problems. Such infections usually clear up after treatment with antibiotics. The birds may be prone to fungal diseases such as aspergillosis. Make sure to keep the cage free of any old wood shaving or other materials that can harbor mold. If the bird does not eat enough fruit and vegetables, vitamin A deficiency can result. Panama Amazons can also be subject to fatty liver syndrome, cancerous fatty tumors, and other health issues related to diet. But a Panama Amazon parrot that eats well and gets lots of exercise may very well live 50 years or more.